It used to be that if you wanted to make a nice scale model of an airplane, you’d be building the frame out of thin balsa ribs and covering it all up with tissue paper. Which incidentally was more or less how they built most real airplanes prior to the 1930s, so it wasn’t completely unreasonable to do the same on a smaller scale. But once injection molded plastics caught on, wood and tissue model kits largely went the way of the dodo. [Marius Taciuc] wanted to share that classic model building experience with his son, but rather than trying to hunt down balsa kits in 2019, he decided to recreate the concept with modern techniques. His model of the Supermarine Spitfire, the vanguard of the British RAF during the Second World War, recreates the look of those early model kits but substitutes 3D printed or laser cut components for the fragile balsa strips of yore. The materials might be high-tech, but as evidenced by the video after the break, building the thing is still just as time consuming as ever. 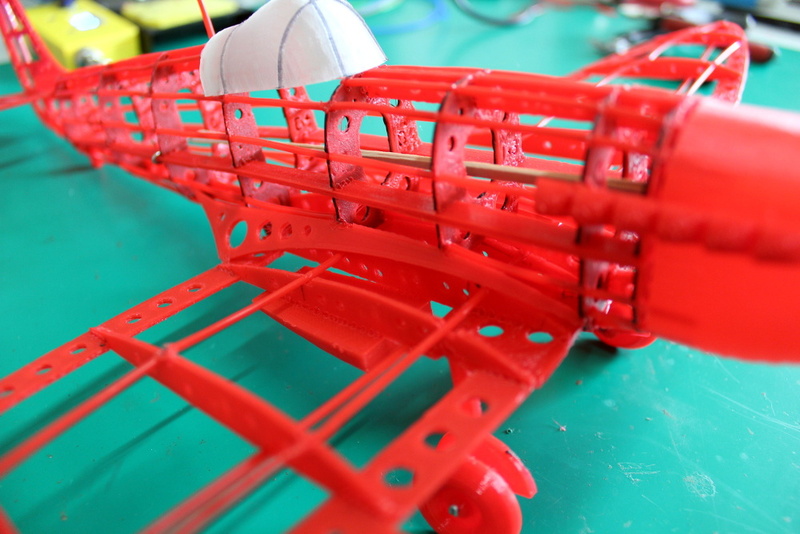 Using a laser cutter to produce the parts would be the fastest method to get your own kit put together (you could even cut the parts out of balsa in that case), but you’ll still need a 3D printer for some components such as the propeller and cowling. On the other hand, if you 3D print all the parts like [Marius] did, you can use a soldering iron to quickly and securely “weld” everything together. For anyone who might be wondering, despite the size of the final plane, all of the individual components have been sized so everything is printable on a fairly standard 200 x 200 mm print bed. While there’s no question the finished product looks beautiful, some might be wondering if it’s really worth the considerable effort and time necessary to produce and assemble the dizzying number of components required. To that end, [Marius] says it’s more of a learning experience than anything. Sure he could have bought a simplified plastic Spitfire model and assembled it with his son in an afternoon, but would they have really learned anything about its real-world counterpart? By assembling the plane piece by piece, it gives them a chance to really examine the nuances of this legendary aircraft. We don’t often see much from the modeling world here on Hackaday, but not for lack of interest. We’ve always been in awe of the lengths modelers will go to get that perfect scale look, from the incredible technology packed into tiny fighter planes to large scale reproductions of iconic engines. If you’ve got some awesome model making tips that you think the Hackaday readership might be interested in, don’t be shy. On a bright spring morning in 1940, the Royal Air Force pilot was in the fight of his life. Strapped into his brand new Supermarine Spitfire, he was locked in mortal combat with a Luftwaffe pilot over the English Channel in the opening days of the Battle of Britain. The Spitfire was behind the Messerschmitt and almost within range to unleash a deadly barrage of rounds from the four eight Browning machine guns in the leading edges of the elliptical wings. With the German plane just below the centerline of the gunsight’s crosshairs, the British pilot pushed the Spit’s lollipop stick forward to dive slightly and rake his rounds across the Bf-109. He felt the tug of the harness on his shoulders keeping him in his seat as the nimble fighter pulled a negative-g dive, and he lined up the fatal shot. But the powerful V-12 Merlin engine sputtered, black smoke trailing along the fuselage as the engine cut out. Without power, the young pilot watched in horror as the three-bladed propeller wound to a stop. With the cold Channel waters looming in his windscreen, there was no time to restart the engine. The pilot bailed out in the nick of time, watching his beautiful plane cartwheel into the water as he floated down to join it, wondering what had just happened. The Chaos Communication Congress is growing! Actually, it’s not, but there may be an ‘overflow venue’ for everyone who didn’t get a ticket. There’s a slack up for people who didn’t get a ticket to 33C3 but would still like to rent a venue, set up some tables, stream some videos, and generally have a good time. Need to test a lot of batteries? Have one of those magnetic parts tray/dish things sitting around? This is freakin’ brilliant. Put your batteries vertically in a metal dish, clip one lead of a meter to the dish and probe each battery with the other lead of your meter. Pravda reports the USS Zumwalt and HMS Duncan – the most technologically advanced ships in the US and Royal Navies – have turned into, ‘useless tin cans due to China’, with ‘Microchips made in China putting the vessels out of action’. Again, Pravda reports this, so don’t worry. In other news, someone found a few USB drives in a parking lot in Norfolk, Virginia. If you have a Prusa i3, here’s a free gift: a Spitfire. The files to print a remote control, 973mm Spitfire Mk XVI are now free for Prusa i3 and i3 Mk 2 owners. Why? Because it’s cool, duh, and [Stephan Dokupil] and [Patrik Svida], the guys behind the Spitfire and other 3D printed RC planes, are also in Czech. Now all we need are Czech roundel stickers.